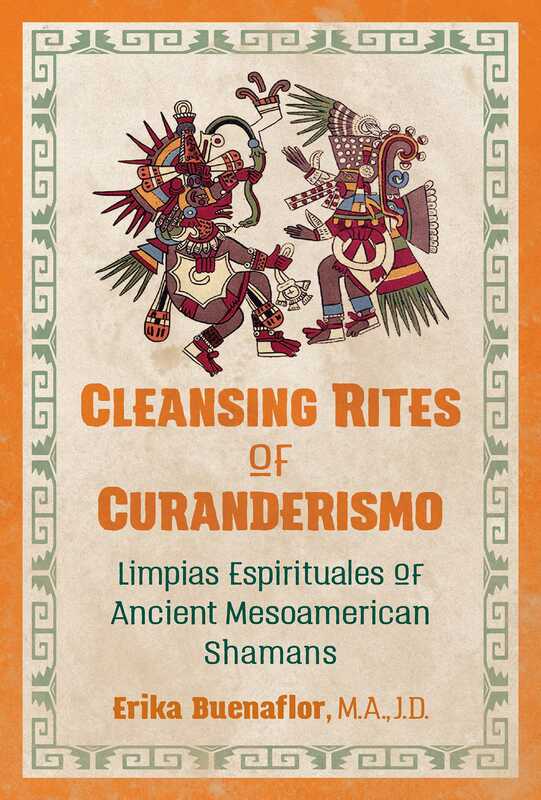 Exploring the essential tools and practices of Mesoamerican shamans and curanderos, specifically the ancient Yukatek Maya and Mexica (Aztec), Erika Buenaflor, M.A., J.D., provides a step-by-step guide for conducting the most common practice within curanderismo: limpias. These practical and incredibly effective shamanic cleanses heal, purify, and revitalize people and spaces with herbs, flowers, eggs, feathers, fire, and water. They are also powerful tools for self-empowerment, spiritual growth, soul retrieval, rebirth, and gracefully opening up pathways for new beginnings. Drawing on her 20 years’ experience as a curandera and her graduate studies focused on Mesoamerican shamanism, the author traces modern curanderismo practices to their indigenous roots. She explores the sacred stories behind limpia rituals and examines different types of limpia ceremonies in depth, such as fire rites for transformation, water rites for cleansing and influencing, and sweeping rites for divination. She outlines how limpias work holistically to enable one to let go and cleanse the body, mind, and spirit of limiting beliefs, traumas, and broken stories; heal acute and chronic illnesses such as depression, insomnia, and anxiety; and revitalize and activate sacred spaces by renewing their essence and clearing negative energies. She explains the healing properties of the plants used in limpia rites and how to perform the medicinal chants used by the curanderos. In addition, the author details how the practice of platicas, heart-straightening talks, supports limpia rites by encouraging one to vocalize their needs as they eject traumas and unwanted energies from the body, setting the stage for self-awareness and healing. Sharing the story of her own complete healing from a catastrophic injury with limpias as well as inspirational testimonies from others who have experienced limpias, the author provides a personal and thoroughly practical guide to the ancient shamanic method of limpias to promote healing and personal transformation in our times. This perspective on and introduction to curanderismo comes from the sacred heart of a Chicana curandera who has been on a quest to understand herself, what has compromised her, what drives her questions, and what she chooses to be now. A quest to lovingly welcome back the fragmented parts of herself into her sacred heart--la India, la Española, la Mexicana, la Americana, la Africana . . . The root of the word curanderismo, curar, means to heal. A curandera is a female healer, and a curandero is a male healer. A curandera/o heals on a holistic level--mind, body, spirit, and soul. Many curanderas/os prefer to work with specific tools and often identify themselves or are identified as specialists by the principal tools they use. Although a curandera/o may have a tool they are particularly skilled at, most are readily familiar and quite skilled in using many healing tools. Curanderas/os work with their hands, intuition, plants, the power of the mind, and the spoken word. The following are some of the more common curanderismo specialties. Sobaderas/os are known for using massage and acupressure points. Sobaderismo treatments are not simply intended to heal or relax the body from physical aches and pains, rather, they are intended to release various kinds of wounds--emotional, spiritual, mental, and physical--that may be stuck in the cellular body, spirit, and soul. A loving touch has a tendency to melt hardness and stubbornness and can be incredibly effective in facilitating a limpia and/or soul retrieval. One of the curanderas I mentored under taught me to use massage and acupressure points to facilitate limpias and release energetic and physical ailments from the body. After a major hiking accident that caused many broken bones and placed me in a wheelchair, I used the techniques she taught me to ensure that my muscles would not atrophy and to relieve my pain. I was able to walk with a completely normal gait in less than two weeks after being in a wheelchair and not walking for almost a year. For the sobaderismo treatments I provide, I move stuck energies from the body using particular strokes, charged essential oils, and hot stones and crystals. I then release this energy with my intention and by placing pressure on particular acupressure points that facilitate that release. I have had clients begin to spontaneously cry and laugh as stuck energy is released from their bodies, leaving them feeling physically, emotionally, and spiritually calm and rejuvenated. Yerberas/os are curanderas/os who work principally with plant medicine. The root word of yerberas/os is yerba, which can refer to an herb, weed, or plant. Many yerberas/os know how to heal and work with flowers, fruit, weeds, tree bark, vines, leaves, vegetables, flowers, fungi, cacti, succulents, and more. They know the healing and magical properties of hundreds of plants, possibly even thousands. Some yerberas/os may work strictly with plants that grow in their area, often because they have established a particular relationship with the spirit essence of these plants. This relationship may have developed from a plant diet, wherein the yerbera/o ingests the plant, prays, and calls forward the essence of the plant repeatedly for a specified number of days. This plant then becomes a bridge to work other plants. The spirit essence of the plant teaches the yerbera/o where to find them, when and how to pick them, and how to prepare them. There are also some rites and work that require plants to be fresh and harvested at a certain time of the day or night, so working with local plants becomes necessary. While in Lamanai, Belize, I had the honor of meeting a yerbero, whose local medicinal plants were located in a lush jungle. I took a walk with him and he could identify the healing properties of hundreds of different plants as well as how to prepare medicines from them. He began the walk by welcoming me and inviting me to join him in a prayer and tobacco offering for the plants. Over dinner he shared that his greatest teachers had been the plants themselves. As a young man, he had a teacher who taught him how to spot, pick, and prepare plants for medicinal and magical purposes. He watched and helped his teacher heal hundreds of people from many different types of illnesses with plant preparations. But what his teacher stressed and required him to learn was how to listen to and connect with the spirit of the plants. Praying, walking, and meditating with the spirit of plants were essential in developing his connection with their essence. My connection and work with plants has developed and evolved throughout the years. My first plant mixture was rose water when I was five, a gift for my mom. Then, when I was eight, I felt it necessary to steep bougainvillea in warm water and add lime for my sore throat. It turns out that bougainvillea flowers have been used by many curanderas/os for colds and sore throats. I dabbled a little here and there, and throughout the years I made various herbal and flower remedies to heal the body, spirit, and soul. On quarterly trips to the Yucatan, where I received the bulk of my training, I always offered to help pick up any necessary plants either at the open air market or from my mentors’ backyards. In exchange for lending a helping hand, the curandera/o was often willing to teach me what the plants were being used for and how to prepare them for things such as sweats, magical preparations, limpias, healing remedies, and much more. Eventually I began my own healing garden and dove deeper into connecting with the spirit essence of plants, welcoming them in to teach me. The plants I work with regularly are some of my greatest teachers.